In a crowded local tea market that includes international brands and established local players, Kanan Devan Tea uses social media to set itself apart from the crowd. 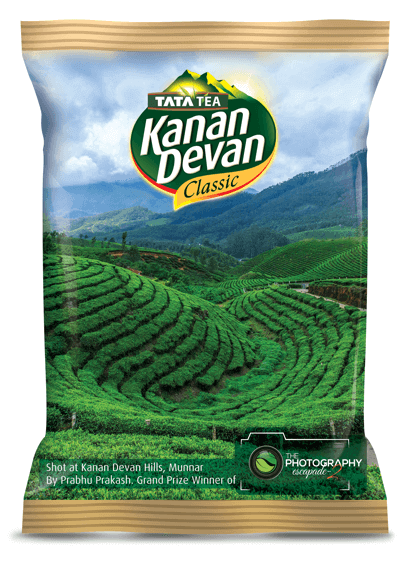 Set in the picturesque mountains of the Western Ghats in southern India, Kanan Devan Tea is a heritage brand that can trace its roots back to the late nineteenth century and has been producing tea ever since. Kanan Devan Tea began using Unmetric through its agency, Maxus, which is part of the GroupM network of companies. 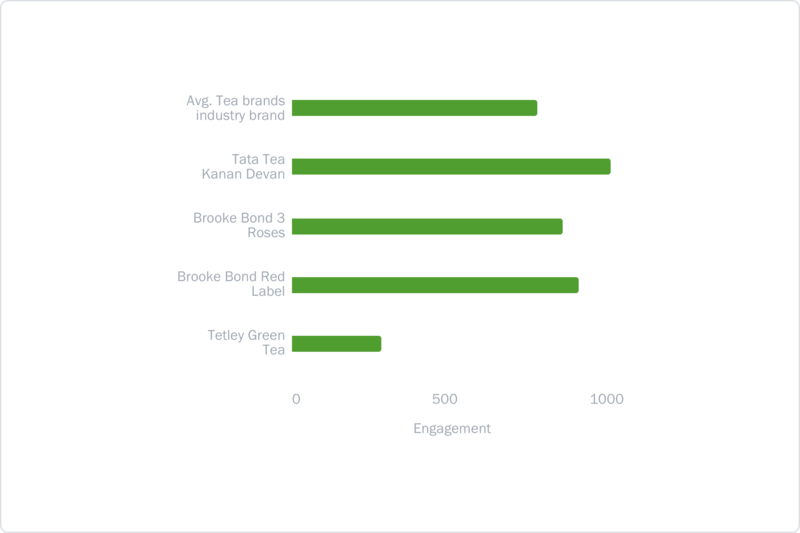 Unmetric enables Kanan Devan Tea to track the performance of their social channels with particular emphasis on tracking their Engagement Score. Additionally, they use Unmetric to conduct month-on-month comparisons of content that’s working for the brand. What did Tata Tea Kanan Devan do? In 2015, Tata Tea Kanan Devan launched the Photography Escapade campaign that invited budding photographers via a contest to the tea estates. Using Unmetric, it was determined that the campaign performed exceptionally well compared to other campaigns and contests. 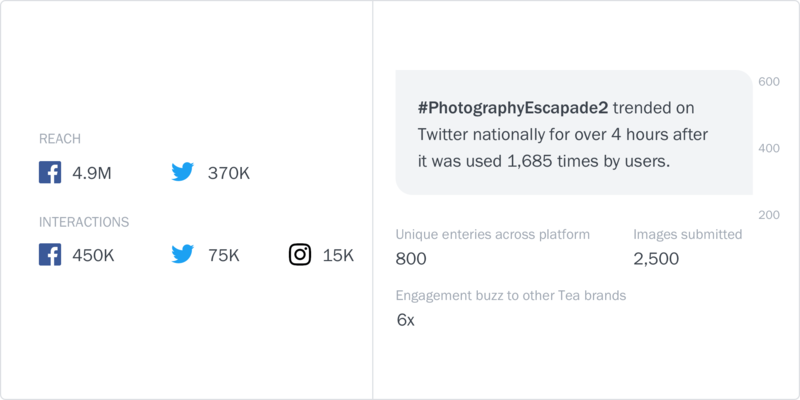 Analysis of post comments and @-mentions provided by Unmetric showed that people were hoping for another opportunity to participate in the Photography Escapade. With this insight, the brand planned its second Photography Escapade in August, 2016. 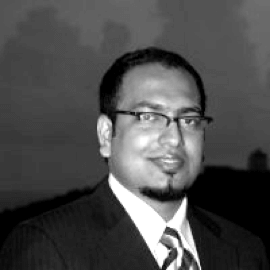 Using Unmetric, Tata Tea Kanan Devan was able to dig up historical data around the type of images from the original Photography Escapade to create a content bank of the most engaging content. This was then used as part of the pre-launch campaign which saw more than 100 organic followers being added to its newly created Instagram page. Additionally, the brand released a sneak-peek video, profiled the previous year’s participants pictures and collaborated with Scoopwhoop to give the new campaign a reach of over 200,000. The campaign involved taking 10 photographers via a contest on a tour of the Kanan Devan hills in Munnar. Given the rise in popularity of 360 videos and photos on social media, a 360 view of the Kanan Devan hills was captured via a drone. Amit Rane, an accomplished photography expert and influencer accompanied the participants to ensure the experience was a learning one and that each photographer was able to capture the unique beauty of the hills. To find the winning photo, users on social media were asked to vote for the photographs by liking them. This social engagement gave higher reach for the campaign and an additional impetus for the photographers to share the content was that the winning photo would be used on a limited edition Tata Tea Kanan Devan tea pack. This is the first time a tea brand has taken social media offline by launching a limited edition pack which showcases the beauty of the hills. “At Maxus, we believe that the real-time assessment of data on the way consumers are reacting to content gives a clear indication on what’s working and what’s not. By monitoring this data diligently, we can assess the kind of content that works for the consumers and initiate actions accordingly. In this case, we realised that content related to mountains (where the tea is grown) resonated far better with our audience and that insight led us to craft The Photography Escapade 2 in a more meaningful, consumer-inclusive way. A campaign that managed to strike the right chord with its consumers in a rich, interactive, and more importantly, in a memorable way. 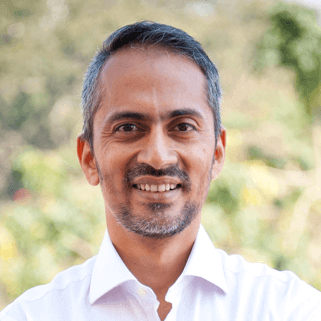 Since 95% of brand content is promoted, it becomes all the more important for Tata Tea Kanan Devan to know what is working in terms of establishing a connection with the user. They do this by analyzing the Engagement Score trends chart. 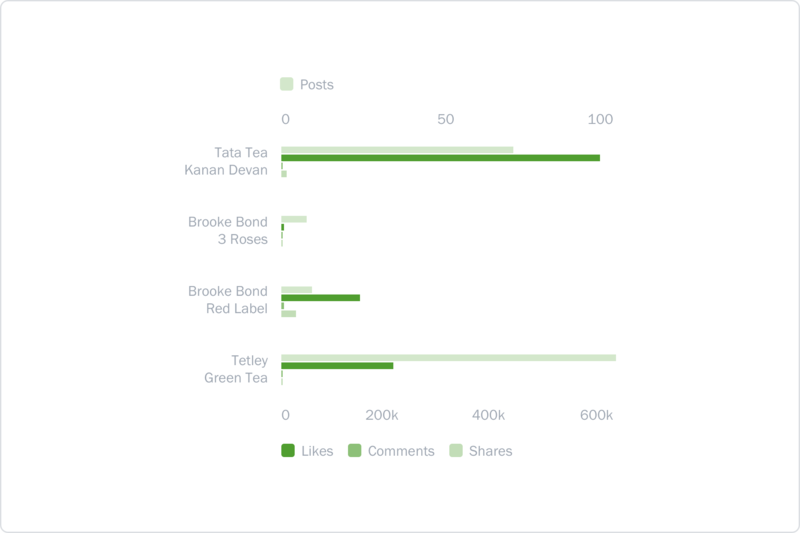 As well as wanting to use the Unmetric Engagement Score to benchmark themselves across brands with varying fan numbers, Kanan Devan Tea also looks at the absolute number of Likes, Comments and Shares to see in what way the content is engaging. 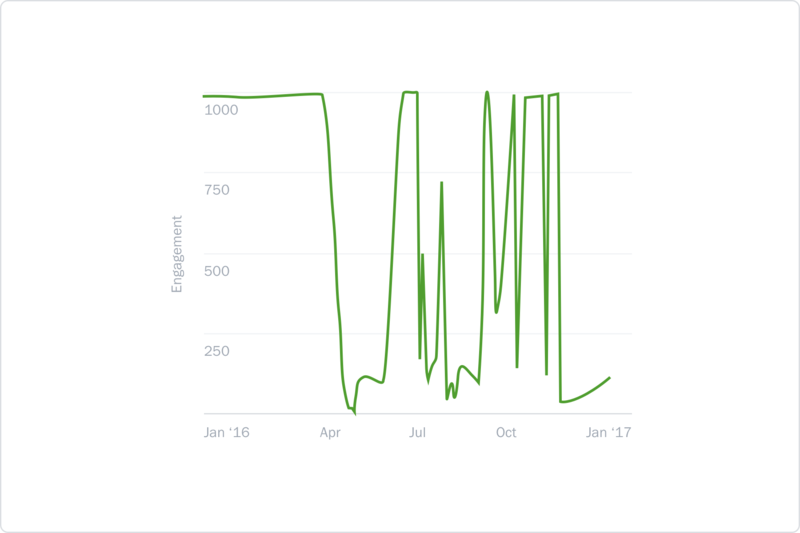 Kanan Devan Tea competes against a number of brands that either don’t have a presence or don’t post regularly on social media. To ensure that they don’t get complacent, they used Unmetric’s custom industries feature to create a basket of brands they wanted to benchmark against. 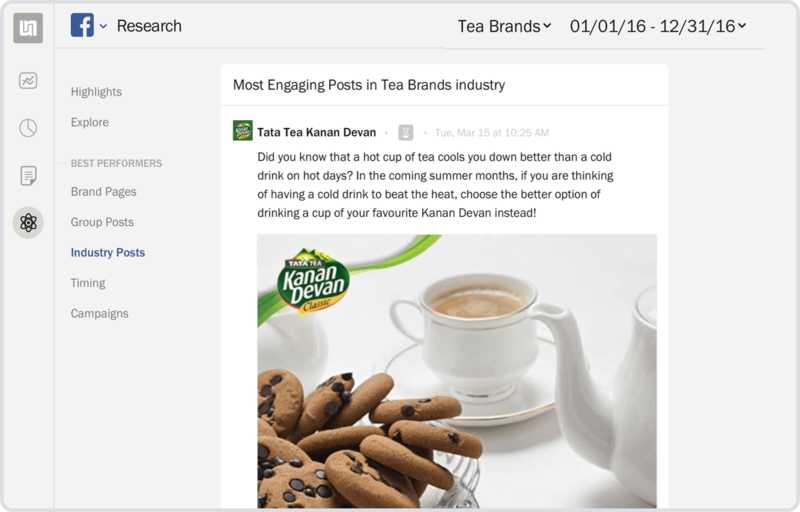 Unmetric’s Research feature gives Kanan Devan Tea instant access to the best performing content from the brands they are tracking as well as brands in their industry. They use this to inform their own content strategy. “We at Tata Global Beverages strive to contemporize our many brands to connect with our target audiences in a unique, exciting and interactive manner. Globally, brands are facing the universal challenge of connecting with their target audiences in an appealing manner. With the changing needs of consumers and the quick pace in which trends are moving, we as marketers are tasked to find the ‘sweet spot’ in connecting with consumers. Kanan Devan being a heritage brand, cracked this challenge with a solution that excited its consumers through the use of photography. As we at Tata Global Beverages have successfully done in the past with Jaago Re and Power of 49, we took a simple idea and transformed it by thinking differently. Through Photography Escapade 2, we encouraged our consumers to experience the story behind their everyday cup of tea. This campaign encapsulates how we as a brand constantly work towards evolving our communication with our consumers by creating interactive and rich experiences.